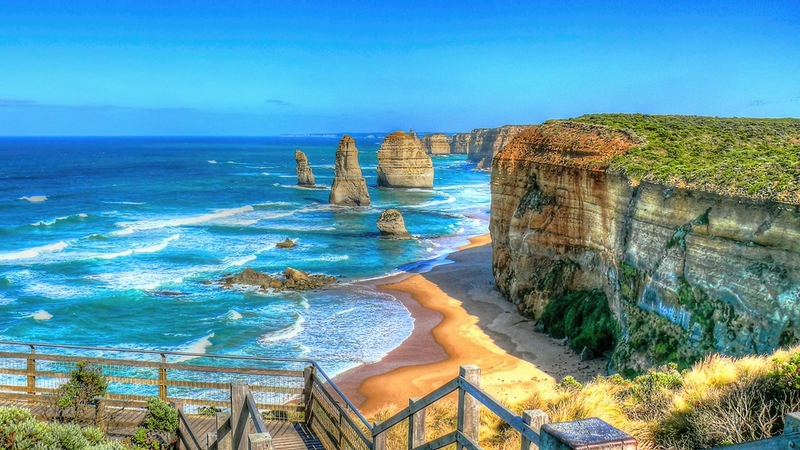 The great Ocean Road in Victoria is an iconic road trip in Australia with some great photo opportunities. Not as long as Route 66 but still of historical significance. You can do the trip one way in a day but much more enjoyable with an overnight stay along the way. Lonely Planet summed it up well when they wrote “Wind down the windows if you’re driving along this road that curves from Torquay to Warrnambool and you’ll cop a unique perfume of bush and beach, gums and salt-water. Some waggish locals call the B100 the Great Bitumen Sea Snake which weaves its way along classic surf beaches before sliding into the Otway Ranges just after Apollo Bay. If you are driving, plan on regular stops to snap the vistas and koalas who don’t mind the spectacular scenery themselves. The 12 Apostles… or what’s left of them.